Thanks to Ryan Tunney, age 12, who graciously modeled for this shot, to his mom Carol Tunney who pushed the shutter release, and to my wife Linnea who held the reflector while I shook hands and directed. Board position is actually Robert Fisher vs. Boris Spassky, World Championship match, game 8, Reykjavik 1972. Clock is a photoshopped print, folded and taped onto a video cassette. 28mm, tripod, manual exposure, Canon E-TTL II 1:4, 580EX on camera with diffuser, 580EX on upper left in 60" Photek Softlighter II, small reflector on right. Lighting from too high caused the shadow under the lip, making it look overly full. The background is a black bedsheet - unfortuantely new with big creases that are still slightly visible, so I didn't light it. This was a big mistake that will cost points, as there's no/little subject separation as a result. Next time I hope that I'll have time to iron, and/or wish for advanced editing. A live model for a challenge is branching out for me - hope that it doesn't do too badly. nice setup and idea. my monitor is pretty bright but i can see the wrinkles in the backdrop but that is not too detrimental. nice job. I love the black and white. This is really good. Great tonal range and very nice take on the challenge. Back for a bump up and a ribbon prediction... Good luck! 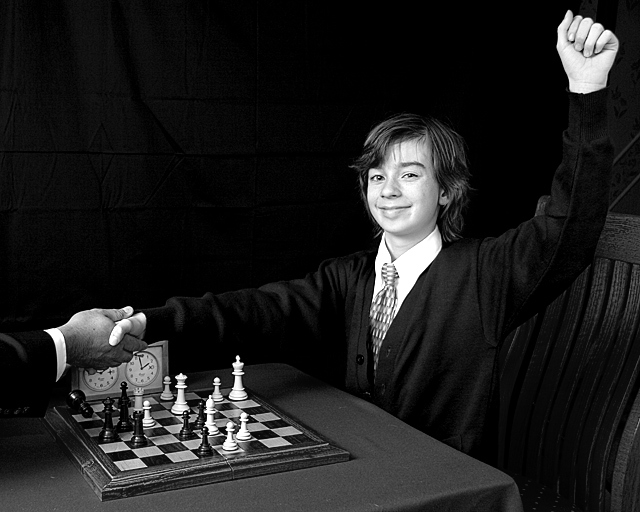 I like the addition of the "shaking hands" to this winning portrait. Excellent set up. What a great choice of topic. Well done. Great shot with beautiful lighting. Nice job. I like the fact that you were able to pull off the black sweater on a black background. Nice job on the setup. Did you have to hunt for one of those timers? Didn't know that before! Overall I like this but there is some detail in the background that keeps drawing my eye away from the subjects. This is great, his expression is perfect. background is a bit messy, but nice try. Proudly hosted by Sargasso Networks. Current Server Time: 04/19/2019 06:19:13 AM EDT.